As some of you may know I am a SHE. A side-tracked home executive. This term is derived from my one saving grace, which works for me about 50% of the time, if I am not sick, or stressed to the max, Flylady. Flylady is a cleaning and organization system, it's not perfect, but it can work wonders if you can stick with it (which I am notoriously bad at, but I make a valiant effort!). 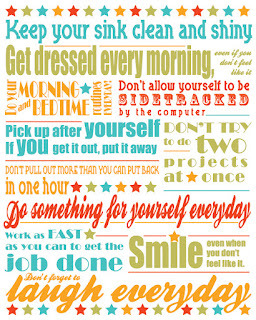 Anyway, why I am really writing about this is because about nine months back I was in a flylady frenzy and designed a wonderful subway art style print of "The Flylady Commandments" . At the time I intended to make it into a canvas print to place in my bathroom, and it was just a personal project. I was so thrilled with it that I posted it on Flylady's facebook wall, and had quite a few people ask for the file for it. I e-mailed many people the file, and felt flattered that someone was interested in what I had created! Well, the other day I got on pinterest and discovered it had been pinned! I felt quite giddy! The problem was it had nowhere legitimate that it could link to. :( So I have decided to share the file here on my blog! I am going to contact the people I have seen pin it and have them change the link to reflect this blogs address. Hoping it will bring in a little traffic and help me start growing and getting out there. So here it is, in all it's glory, feel free to download it here. Go ahead and share it, pin it, print it out and frame it, whatever you would like. If you like this make sure to follow my blog! I am getting into a new round of Flylady right now and plan to blog a little about it and share more Flylady inspired Printables! So hit that follow button! This is fantastic! You're super good at design btw. And I love flylady! I have a love/hate relationship with Flylady, which I think stems from the fact that I am the only one who does it... if I am sick, or busy, and don't follow my routine, no one else does, and things get overlooked and make more work for me again. *Sigh* Just need to train Dominic to follow my routine, he says it makes no sense to him. "What's swish & swipe?" "What's a hotspot?" LOL. I have been searching for you! I remember when you made it and I put it on my page. Everyone wanted to know who made it and I couldn't for the life of me remember. In fact it is so pretty it should be in a frame! Marilyn Foster. I was pretty happy to see it up! I had a TON of people ask me for the file so they could print it. Being the SHE that I am I failed to get it printed and put up myself... LOL. came here from Flylady website. Love this design: colors, font choices, everything. Great work! I think you've got proper credit everywhere now. It's so pretty! I keep wanting to print it myself; I need to buy some large-size printer paper. I am going to have this framed! Love it. Aww! So honored to have a place in your home! Hello, I just found this on Pinterest today, and I just love it - thank you so much! 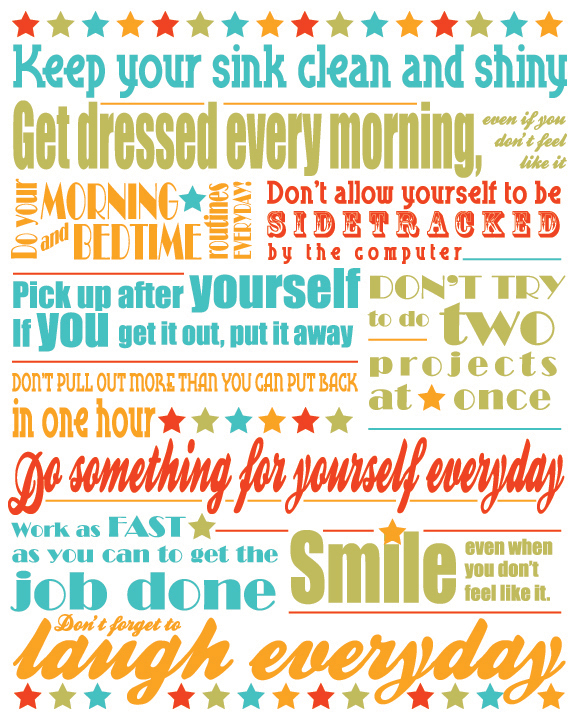 I am a Flylady fan too - although not very good at it - and I love that a lot of her wisdom is in this printable. I am looking forward to getting a frame for it. Again, thank you and best regards. Thanks so much for your comment! I am not very good with Flylady either. Though I try! I remembered seeing this some time ago, and wanted to print a decent copy - I've been searching on and off all day and now I've found it! Thank you so much. It's really lovely. Hoping it will inspire me to get back on it with the FlyLady system (or the little of it that I managed in the past at least! ).